The plurality of materials used in dentistry have been subject of uncountable studies in the field. Intolerance towards dental supplies can show in most diverse ways - allergies, tension, headaches or lacking ability to focus. Modern “anti-allergic” materials promise improvement. Metal-free ceramics as zirconium oxide have become the material of choice when it comes to designing aesthetic long-term dental prostheses of high quality. Zirconium oxide is similar to our teeth in features and bares many advantages: avoidance of dark crown-rims, high translucence, anti-allergic, high biocompatibility. Dental prostheses made of zirconium oxide is completely metal-free and is much less frequently rejected by the body than metals or synthetic material. In the production process of prostheses zirconium oxide serves as scaffold for crowns and bridges. The size of the bridge is unlimited. The new, metal-free teeth look highly natural. 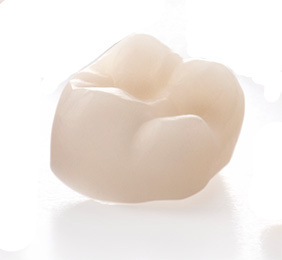 This high-quality material allows us to implant demanding, metal-free and convincing solutions.